The flowers here extend diagonally from the lower left foreground to the extreme upper right. 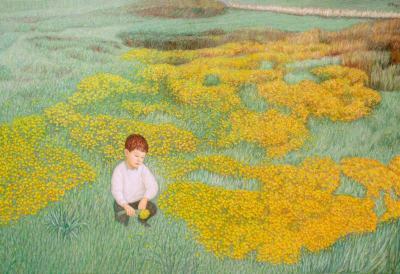 The child, unable to take in the immensity of nature's gifts (as happens to all of us, when we contemplate the immensity of the universe), limits his attention to only a few flowers in his immediate vicinity, making a small bouquet of them in quiet gratitude. But, despite their limitations, the innocents always have something to teach the wise. “That is the one eternal education: to be sure enough that something is true that you dare to tell it to a child. The poet only asks to get his head into the heavens. It is the logician who seeks to get the heavens into his head” (Gilbert Keith Chesterton). “You don’t really understand something unless you are able to explain it to your grandmother”. “The knowledge and feeling that what is imprenetrable to us really exists, manifested in a supreme wisdom and most radiant beauty that our puny faculties can only comprehend in the most primitive ways, lies at the centre of all true religiosity” (Albert Einstein).